Sensors of various types help monitor and control processes. They relieve people of tasks, particularly in dangerous environments, and simplify work processes. Often sensors are equipped with a sort of "intelligence" in the form of electronics that process the sensor signal. Further, many sensors have a communications interface so they can transfer data over a network to a central computer. The application range of sensors is equally large and continues to grow: smoke alarms, motion detectors, temperature sensors, humidity sensors, level detectors, smart meters as well as flow and volume metering are just a few of the application areas, whereby this list could continue indefinitely. In order to meet the requirements of sensor protection in an optimal way, SCHURTER developed the USx line for overcurrent protection in secondary circuits. The USx line consists of six types in various SMD sizes from 0402 to 1206 and with rated currents from 50 mA to 25 A. Considerable breaking capacity as large as 600 A at rated voltages of up to 125 VAC/VDC make the chip fuses in the USx line unique in the market. The partially gold-plated contacts also have a positive impact on usability, storage life and the electrical qualities of USx fuses. The special design of these chip fuses also results in a low voltage drop. A further aspect that makes the USx line special is the tripping time. The SCHURTER fuse reacts with a typical tripping time as short as 0.5 milliseconds with a tolerance band of from 0.4 to 0.6 milliseconds. These performance characteristics also do not change even under high pulsed loads such as those that can arise in an environment with electronically commuted motors. The UMT-H, UMF 250 and UMT 250 SMD fuses were developed for primary protection on SMD circuit boards. They are designed for rated voltages as large as 277 VAC, respectively 250 VDC and are available with various current ratings. With a high breaking capacity extending up to 1500 A, the UMx line offers the ideal solution when dealing with high fault currents. 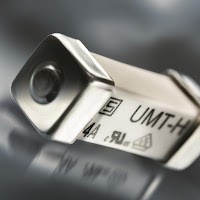 The cuboidal design of the UMx line meets all the requirements of SMD technology as regards processing. Based on their encapsulated qualities, they can also be used in potentially explosive atmospheres. The model UMT 250 is also available with pre-attached clips. Sensors are used everywhere in the world. Whether they are battery driven or powered from the grid, it is important to have suitable protection for electronics. For this purpose, SCHURTER offers such SMD fuses for primary and secondary protection. These fuses stand out due to their compact design, low power dissipation and a tight time tolerance for tripping.